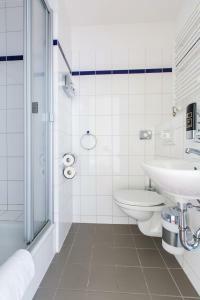 Bright, non-smoking rooms with private bathrooms are offered at the a&o Hamburg City. Rooms are decorated in sunny yellow colours, and bed sheets and towels are provided in the private rooms. Breakfast or half-board meals can be booked at the Hamburg City. There are also vending machines for snacks and drinks, and packed lunches can be prepared on request. In the evenings, guests can relax in the Astra Bar. There is also a games room with billiards, table football and a Wii games console. Younger guests will enjoy the children’s play room. Guests can enjoy satellite TV broadcasting various sport channels in the lobby and bar. Sightseeing tours can be booked at reception. Underground and S-Bahn trains run directly to Hamburg Central Station, Hamburg Harbour and the lively Reeperbahn.